The Black Bear Loop, located on the Sun Mountain trail system just above Winthrop, is superb. 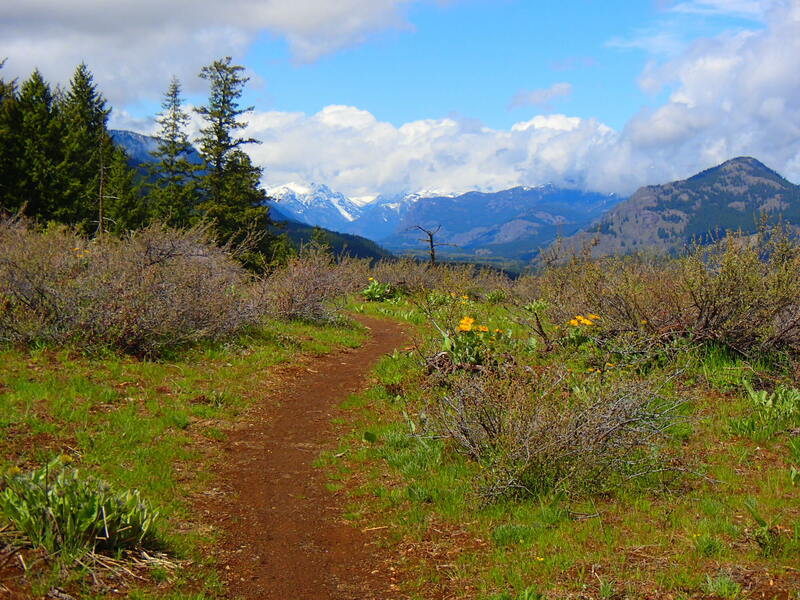 It doesn’t offer the high alpine views of some of the trails up in the North Cascades, but it’s close to town, has lovely views of the valley floor, is covered in wildflowers in the spring, and has just a lovely rolling nature to it. Even with all the trails around, I probably run this one once a week all summer long. From the Chickadee parking lot, run back down the parking lot road until you see the Beaver Pond trail on your left (just before you get to the road junction in .1 miles). Follow the Beaver Pond Trail until its terminus at the Hough Homestead (the big open area with picnic tables and outhouses). From here, at mile 1.4, head down into the woods, bending slightly right onto the Fox Trail. You’ll follow this short connector just .2 miles before taking a hard right onto the Black Bear Trail. Now the fun starts as this trail rises and falls and heads out onto some open exposed rock bands. You’ll follow this trail for just over 3 miles before you take a right on the Winthrop Trail and start your climb back to the parking lot. You’ll climb steadily uphill for about a mile before hitting the Sun Mountain cabins. Just past the cabin parking lot, the Cabin Trail takes off into the woods on your left. Hop on it and follow it another .7 miles uphill until you turn right on the Chickadee Trail and back to your car. 11.5 mile option: For a shorter drive, and longer loop, you can park at Tiny Town on the valley floor and run or hike up the Winthrop Trail. You’ll meet the loop in 2.3 miles, at the intersection of the Winthrop Trail and Black Bear. Driving Directions: From Cascades Outdoor Store in downtown Winthrop, head East on Highway 20. After crossing the Methow River (.5 miles from the store), bear right onto Twin Lakes Road, heading past Winthrop Physical Therapy and drive 3 miles. Turn Right on Patterson Road and follow it 5.2 miles to the Chickadee Trailhead sign pointing you to your left. Follow this short road and park in the large parking lot. For Tiny Town Parking, after bearing right on Twin Lakes Road, drive 1.6 miles. You’ll see a very small parking lot down in the trees (enough space for 3 cars). Park here, respecting the neighboring driveway and leaving room for as many as possible.